Here am sharing a sweet treat for all those sweet tooth guys. A Malabar sweet (Kerala recipes) which is known as neyvada in the malabar region with a crispy crust and soft juicy inside. I searched google for a perfect recipe of neyy vada but it is surprising that am unable to find even a single recipe for neyy vada. May be it is known by some other names. But still, the name ney vada is very popular among Malabar sweets or desserts. It is very similar to the Indian desserts Balushahi and Badusha (diwali sweets recipes). The recipe is almost same as balushahi except for the addition of egg and ghee. 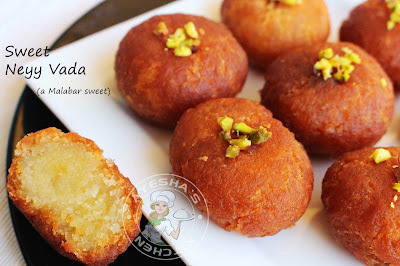 Bhalushahi and badusha are famous sweets among South Indian sweets. As the name implies (neyy means ghee and vada mean ball-shaped dish), Neyy vada must be kneaded well with ghee and egg mixture without any exception. This will be an easy sweet snack recipe if you follow the same measurements. You can also try this quick sweet snacks for parties too. For sure, it will attract the crowd. This sweet vada recipe drives me crazy these days. Do you know why? This is the one among my hubby's favorite sweet snacks which I tried for days to reach the perfection. Finally, I succeeded and made the perfect sweet ney vada. 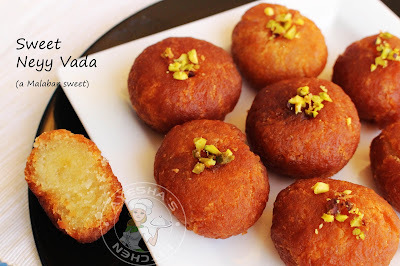 Hope you all will try this yummy sweet ney vada (may be called by some other names). Here is the recipe of easy Indian sweet recipes / easy mithai recipes /easy sweet treats / sweet snack to make / how to make sweet vada / neyyvada. Firstly let me say that these measurements are accurate. So no need of adding more or less of these given ingredients. Take a wide bowl to add All purpose flour, baking powder and baking soda. SIEVE them before adding. This is very important. To this add softened butter and mix it well in the flour mixture with your fingers . To this, add the melted ghee and mix it well LIKE BREAD CRUMBS. The ghee must be mixed well with the flour. Be careful - DO NOT KNEAD NOW but mix well with fingers to form fine bread crumbs. Now whisk egg, curd and sugar very well in a bowl. Add this egg mixture little by little to the flour mixture and KNEAD WELL to form a very soft dough. The dough must be kneaded very well . When done, set aside for HALF AN HOUR, must be COVERED. Do not skip this step. So meanwhile make the sugar syrup. Heat sugar and water in a pan. Let it boil and form one string consistency. Add lemon juice and cardamom powder. Mix well and off the flame. After half an hour, heat a small nonstick pan with oil /ghee for frying . I PREFER NON STICK PAN than a normal wok. Once hot, make the FLAME LOW. This step is very important else results in an inner uncooked neyy vadas. Now make small balls with this soft dough. DO NOT KNEAD at this stage, but roll to form SMALL BALLS within your palms. Slowly FLATTEN and make HOLE in the middle. Dip in the oil one by one. Repeat the same with rest of the dough. FRY in batches. Flip the other side after 2 or 3 minutes. Fry on a MEDIUM LOW FLAME UNTIL GOLDEN. Do not fry in high heat. Then TRANSFER it to the plate and set aside to cool down and serve. It (the outer part)will be very soft when eating immediately but once cooled, the crust becomes crispy with sweet softness inside. It tastes very very nice, soft, juicy with crispiness the next day. Can be refrigerated for 2-3 days.